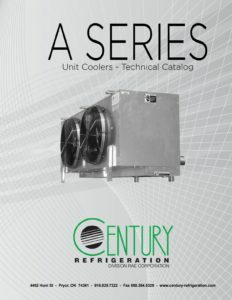 Century Refrigeration’s A Series medium profile unit coolers are designed for larger walk-in coolers and freezers. 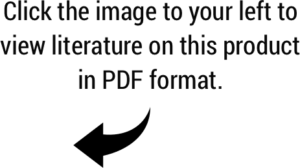 The A Series may also be utilized in warehouse cooler and freezer applications for product pull down and storage in the commercial and industrial refrigeration markets. The A Series unit coolers are constructed of a heavy-gauge, smooth finish aluminum cabinet with a copper tube, aluminum plate fin coil, and permanently lubricated ball bearing fan motors with inherent thermal protection. These draw-through units are designed for ceiling mounting and are available in air defrost, electric defrost, and hot gas defrost configurations. Heated (with hot gas loop) and insulated drain pan, sideport connection on the distributor, one (1) check valve for TXV bypass (shipped loose) and adjustable defrost termination/fan delay are standard.